Click here for this month’s edition of District News and Announcements. 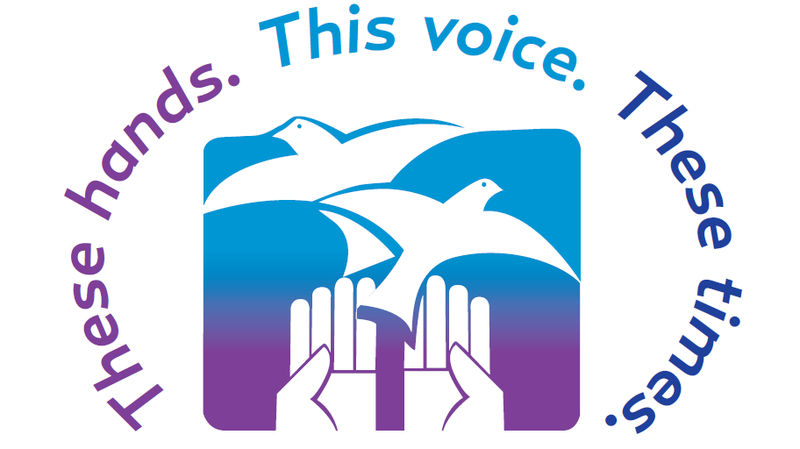 Last year at District Conference we introduced a multi-year fundraising campaign for the Northern Plains District with the theme: These hands, This voice, These times. These hands that can reach out, welcome, comfort, create, provide and repair. This voice that can speak with honesty and truth, share stories of life, love, loss and faith, inspire hope, challenge wrong, and offer wisdom and counsel. These times in which we live, times of change and complexity, times of great human suffering and global problems, times of searching for faith, hope and love, times ripe and ready for the work and witness of our church. We are sending this note as a reminder to bring your fundraising dollars to the 2012 District Conference and, just as importantly, bring your stories of how you raised the money. We have an anonymous donor that will match your congregation’s contribution. Our budgeted goal for 2012 fundraising is $10,000, so don’t hold back on creative stories even if your fundraising approach was rather boring. It’s all in the delivery, so have some fun and help us reach our goal; $5,000 with creative stories is all it will take. At the Saturday evening service at District Conference, we will gather the monies raised – from containers distributed last year and other fundraisers. Please label the offering you present so we can keep track of individual and congregational contributions. And if you wish to present your container, it can be returned to you. If possible, send your fundraising stories in advance of District Conference so they might be shared as part of the Saturday evening service. Email them to janispyle@yahoo.com. Click here to read the July 6 edition of District News and Announcements. It has been a privilege for me to serve as the Northern Plains District Moderator this year. Throughout my eight years of serving on the District Board, it has been a joy to witness the board working hard to do the work of our district. I lift up in my prayers the District Board as they continue to work with and connect the people from across the district to minister together. I appreciate and respect our District Executive, Tim Button-Harrison. Thank you for all you do for us through teaching, guiding, encouraging and being an example to us. You are a great asset to our district. To picture, envision, make up, dream, invent, visualize, see in your mind’s eye, think of, and conceive. These are some words to help us understand the word ‘imagine.’ I want us as a district to think “outside of the box,” and IMAGINE what God has in store for us. Think of the possibilities, the opportunities, both small and large that are awaiting us. Pray that God will open your heart and mind to ways that you can be part of this vision. Pray for your involvement and for the involvement of others. Have an open mind to what God is telling you to do . . . then obey. Believe great things from the Lord. Be ready to take some new steps of faith as you IMAGINE! My prayer, for our district, is that we provide support for each individual church. I know there are cultural differences between each church. Knowing that we are not the same but, enriched by all. Our different perspectives help our district boards, commissions, and committees make the best decisions for all. May we be one in Christ. Blessings to our Moderator Elect, Roger Emmert, as you serve our district. I am looking forward to helping you and continuing to be active in our district. Last, but not least, I want you to IMAGINE . . . I want you to IMAGINE participating in District activities and/or serving on the District Board, to see what a different you can make in your church, our district and God’s world! Let’s IMAGINE together . . . as an individual, a church, and a District to see what God has in store! As we celebrate the 50th anniversary of Friendship Lodge, our summer camp staff is collecting the stories that together create Camp Pine Lake. The stories we gather will be put together in a book for all to enjoy. We need your help, and we would like you to send your camp stories, old and new. Stories, poems, pictures or drawings may be submitted, and we are also available to interview and transcribe stories. Click here for the June 2012 edition of District News and Announcements. Click here to read this month’s District News and Announcements. time you can give for the Conference. We are all enriched when we participate. Below is a list of the Volunteer Coordinators. Please note that some area coordinators have made specific requests; you may contact them directly. Other areas may need volunteers, based on registrations that are received. If there is an area where you would like to volunteer your services, please contact the Coordinator listed here. I first of all want to bring you the warmest greetings from the wider church. On this special day of Pastor John’s installation, know that your sister churches, both near and far, are with you in prayer. The title of my message this morning is Partners in God’s Mission. Let me give some introductory comments before I read the scriptures for today. To be a partner is to be joined and united with someone for a common purpose. Business partners join for the purpose of common work. Marriage partners join to create a home and family. To be a pastor or a church, you can’t do that alone. You have to join with others. There’s no such thing as a go it alone pastor. And no such thing as a church where the members all do their own thing. But the partnership we’re talking about is even greater than something between a pastor and a congregation. Whose work or mission joins us in partnership? Your mission? Mine? John’s? God’s! God’s mission. Our partnership, our work, starts with God – comes from God – belongs to God. God the Creator. God of Abraham and Sarah, Isaac and Rebekah, Jacob and all his kin. God who heard the Israelites in slavery crying for freedom and who sent Moses to deliver them. God of covenant and law, wisdom and truth. God of the prophets demanding justice. God who sent Jesus to proclaim good news to the poor, release to the captives, recovery of sight to the blind, forgiveness of debts, letting the oppressed go free. And God who, when Jesus was nailed to the cross and sealed in the tomb, wouldn’t let death have the final word, but raised Jesus from the dead and whose love was poured into our hearts and whose Spirit provides gifts to the church. Now the way I see it – today isn’t only about officially installing John as your pastor. (By the way, that word installing sounds like putting in a new furnace or air-conditioner and making sure all the wires are hooked up correctly.) Today is also a day of re-commissioning this congregation. So everything I’m going to talk about – it’s about John but it’s also about each one of you who are part of the ministry of this church. To be in God’s mission – we need to first of all be partners with God. But we also need to be partners with each other. And beyond that, we need to be partners with our neighbors – with people in the world around us. So let think about this threefold partnership — partnership with God – partnership with each other – and partnership with those in the world around us. Somewhere along the way, God got through to me, and I answered “Here I am God – use me.” After that, nothing was the same. And I know somewhere along the way, God also got through to John and he answered “Here I am God – use me.” Maybe he’s shared some of that story with you already. To be a pastor or to be a disciple – to be a follower of Jesus – means somewhere, sometime, somehow, we opened our lives to God. We said, God, shape me. Mold me. Fill me. Use me. And this opening to God is something we have to choose and renew each day. The Apostle Paul writes in Ephesians 3:14-19 about what happens through this inward change… “I pray that God may grant that you may be strengthened in your inner being with power through the Spirit and that Christ may dwell in your hearts through faith, as you are being rooted and grounded in love.” This is what happens to us when we decide to work with God – strength starts growing within us — God comes alive in our hearts and begins to fill us – and now we start to experience love within and all around us. But to keep that fire burning – Prayer is needed. And worship. And study of the scriptures. And all these things with a humble spirit – a listening spirit – a spirit yielded and open to change. Open to being changed by God from the inside out. And that’s going to mean more humility and less pride. More patience and less worry. More waiting, less striving. More gentleness, less forcefulness. More love, less fear. More of God and less of ourselves. And then comes partnership or working with one another – with our brothers and sisters in Christ. You remember the sending of the seventy? The mission wasn’t for go-it-aloners. Jesus sends his followers in pairs. Where two or more are gathered in my name, there am I in the midst of them, says Jesus. God’s mission isn’t accomplished through lone rangers. It’s accomplished through teams. By people working together. Working in partnership with our brothers and sisters means, above all, loving one another. And what is love? Again Paul, from 1 Corinthians 13 — Love is patient; love is kind; love is not envious or boastful or arrogant or rude. It does not insist on its own way; it is not irritable or resentful; it does not rejoice in wrongdoing but rejoices in the truth. Love bears all things, believes all things, hopes all things, endures all things. In the Gospel of John, chapter 13, Jesus kneels down and washes his disciples’ feet. And then he says, “I give you a new commandment, that you love one another. Just as I have loved you, you also should love one another. By this everyone will know that you are my disciples, if you have love for one another.” Love is the way we work together. And finally – partnership with the people in the world around us. I’m going to put this bluntly. We in the church spend a lot of energy focusing on ourselves, our problems, our disagreements. That’s not all bad but these things can consume us if that’s all we think about – and it’s like being self-centered. So what if we turn our attention in a more outward direction – with a generous and selfless concern for those who are beyond the church community – especially the poor, the marginalized, victims of greed, fear and injustice, the hurting, the lonely and the lost. God did not make the church for its own sake. God made the church for the world’s sake. Just as Jesus came because God so loved the world – and came not to be served but to serve – so likewise the church exists because God so loved the world and the Body of Christ, we the church, are called to reach out to the world like Jesus did. Jesus taught, if you seek your life, you will lose it. If you lose your life for my sake and for the gospel, you will find it. To work with those outside our church, is to recognize God is out there and working within the world – so if we only focus here, inside the church, safe and secure, we’re going to miss out on a lot of what God is doing, and we might even miss our very purpose and calling –to discover what God is doing in people’s lives – out there in the world. Also, did you notice when Jesus sends out the seventy in Luke 10 – he says don’t take a lot of stuff. Just go. And let the people you meet out there take you in. Eat what they give you. Find out what life is like for them. Listen to them. Hear their story. Then you will know better how to reach, how to help, how to heal, how to share the good news of God’s love in Jesus Christ. Jesus says go, listen and learn. And when you go, listen and learn, you’ll be surprised by what you discover. That God is very much alive and at work beyond these walls. Be partners with God. Be partners with each other. Be partners with God’s world. This is my threefold charge to you, John, and to you, brothers and sisters of Iowa River Church of the Brethren. Be partners in God’s Mission together.